Atty. 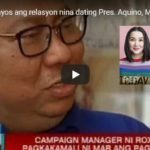 Vic Rodriguez of the Marcos Camp said that Leni Robredo again fooled the people by saying that she had difficulty in raising the money to pay her counter-protest against Bongbong Marcos. After all, she paid half a billion pesos according to her SOCE in the last vice presidential elections. [VIDEO]: Atty. 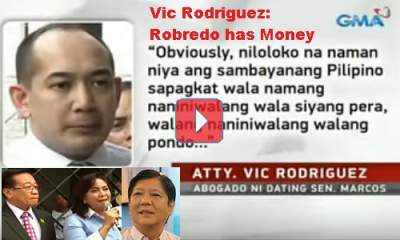 Vic Rodriguez of the Marcos Camp said that Leni Robredo fooled the people once again. It is evident that Leni Robredo is not on to the will of the people in last year’s elections. She said she would never allow the son and namesake of the late president Ferdinand Marcos to grab the second highest office in the land and return to power. This is the only thing that matters to her; to block Bongbong Marcos from the Vice Presidency. 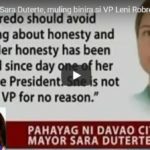 Robredo’s words are contradictory to her actions. She said; “Even if it’s difficult, even if we’re going through many challenges, we will not let the voice of the people be taken away.” She said this when addressing her supporters outside the Supreme Court where she paid P8 million counter-protest deposit. If it is the voice of the people she is after, she wouldn’t keep on delaying the electoral protest of Marcos. She added; “You know that this fight is not about me. This fight is about all of us.” Robredo is again lying when she said this. Her own words contradict this statement. Perhaps, she has to be reminded why she agreed to run under the Liberal Party for the VP post – did she said to block Marcos? The truth is, she allowed herself to be used as a political prostitute against Marcos for her own personal gains. She also said the country suffered during the brutal martial law regime. An alleged victim, former Commission on Human Rights chair Etta Rosales even joined who failed to bring out the truth in history that there was really such thing as the Golden Age of Marcos. 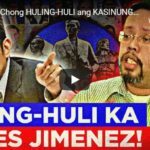 They were also joined by another bitter activist priest Robert Reyes and members of their online group The Silent Majority who despite using their channels in destroying the Marcoses are still no match for the people’s voice via social media. Next post: Why is Rappler Paying for Robredo’s Google Adsense Advertisements?